Peter Clark is not such an ordinary boy, since he’s quite a loner with exceptional computing skills, but then it’s not surprising he’s become introvert after being abandoned by his mother and brought up by his grandmother. The story starts in a beautifully described storm, where Peter is scared to open the door to let a stranger in (quite rightly), but then realises it’s his uncle. Despite his grandmother’s opposition, Peter joins his uncle on an expedition to Mexico, having learned a lot more about his past and his mother, and a little bit about what he might grow up to be. Of course, the expedition does not go smoothly; Peter is pressed to demonstrate considerable resourcefulness, and finds friends in the right places who help him out of a whole load of difficulties, caused by… a baby dragon. Awww! Who wouldn’t want to rescue a baby dragon? Well, you might change your mind if its mother showed up! Peter shows he has the skills necessary for such a task, and the whole story twists and turns through numerous encounters with baddies seeking to destroy the dragons and take parts of them said to have magic powers. Rhino and elephant poachers spring to mind. This is an exciting, well-written, fast-paced story that I didn’t want to put down. 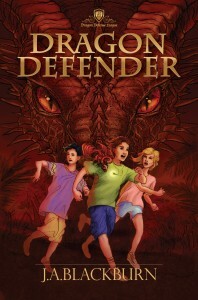 The characterisation is first-class and the dragons… gorgeous. I’m looking forward to more books from J A Blackburn! PS Everyone should carry a wind-up torch, but then, the adventure wouldn’t have such an edge! It was a fun book. And, you’re quite right about the storm description in the beginning being brilliant. Thanks for dropping in, Destiny! I thought this was a great read too. It was nice to read your opinion of the book. Thanks for sharing! Thanks, Stacie – nice to see you here!